Personalise this set of Hand Cut Diamante Heart Whisky Glasses with Swarovski Elements, with any message of your choice over 4 lines and up to 20 characters per line (1-3) and 4 characters on line 4. 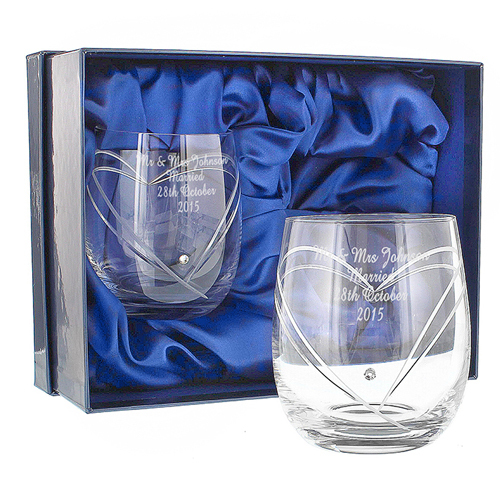 Each glass is hand cut, hand polished and embellished with Swarovski Elements Come presented in a silk lined box. A hand-blown glass piece may have slight irregularities, or even a slightly asymmetrical form. We are unable to guarantee imperfection free glassware. Please note -we are unable to support special characters or accented letters, please refrain from entering these within your personalisation.